Mantodea (meaning southsayer) is believed to have appeared in the Pennsylvannian. These insects have highly modified front legs often held in a position suggestive of prayer, hence the common name "praying mantis, or simply mantis. Mantids are ferocious predators and to facilitate their predation natural selection has equiped them with many stealthy including coloration, structural adaptations and behavioral modeling to deceive prey of their lethal intent. Mantodea comprises some 1800 extant species. 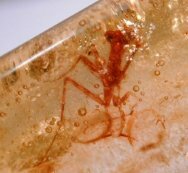 11 mm long praying mantis in Colombian amber. The spikes on the raptorial (siezing) forelegs are readily evident.